Whomp whomp. There're no Monster Claw Carnages for sale. Well I'll be darned, this sucker really does exist! Admittedly, I'm a little late to the game with this guy, but this has probably been one of the hardest figures for me to find since I started collecting 3 3/4” figures. But at long last, a random stop at a store while I was out of town yielded me the elusive Carnage figure from the Spider-Man line; I was starting to think this little guy was just a myth. 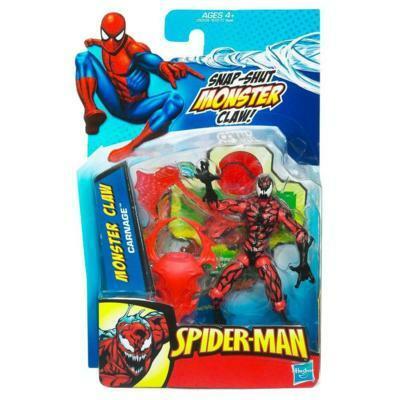 Part of Wave 4 in the Spider-Man line Carnage had an original retail price of about $7.00 (USD), depending on where you bought him from. The newest addition to the line, Carnage and the Ben Reilly Spider-Man figure were the only two new figures in this wave, making them extremely hard to find, and even harder to tell if the wave had even been put on the shelves once those two were gone. Working from the feet up, the first articulation point you'll find is in the knees; there is no articulation in the ankles. The knees use a ball-hinge and swivel-point for articulation. The ball-hinge provides about 90° of motion while the swivel-point provides a full 360° of rotation for the lower-leg. The hips use a ball-hinge with a swivel-point at each end. The hinge itself allows for about 90° of lateral motion, while each of the swivel-points provide 360° so that you can rotate the ball-hinge's orientation when it comes to posing. The wrists are articulated with a swivel-point at the top of the gloves. The swivel-point allows you to rotate the hands a full 360° around. In the elbows you'll find a ball-hinge and one swivel-point above it. The hinge itself allows for roughly 180° of movement, while the swivel-point allows 360° of rotation to change the ball-hinge's orientation. The shoulders also use a ball-hinge and swivel-point, the ball-hinge provides a little over 45° of lateral movement, while the swivel-point at the top provides 360° of rotation. The head is attached with a ball-joint at the top of the neck. This allows for a full 360° of rotation for the head, as well as the ability to tilt the head slightly up and down, or tilt it from side to side. This is a really fun figure. One of the things that I'm really digging about this figure is the exaggerated hand molds. Most 3 3/4” figures use hands that can be painted different color and be used on multiple figures, but you can tell these hands were made for Carnage, and there aren't too many other characters that they could be used on. Just by having knee articulation, Carnage comes out miles ahead of any of the previous Spider-Man figures I've purchased; while it's not quite up to par with figures from the Marvel Universe line, it is definitely the pinnacle of engineering in the Spider-Man line. The paint applications are adequate, a slight smudging here and there, but nothing too out of line for a figure of this scale. The plastic however, is a bit on the rubbery side. This gives the figure a slightly cheap feel, nothing that you're going to notice if it's just displayed, but it's pretty obvious when handling it. Overall this is still a nice figure. If you're lucky enough to find one a retail I wouldn't hesitate to recommend purchasing it. While it's not quite up to par with the figures from the Marvel Universe line, it does make for a great way to fill out your 3.75 inch Marvel collection. Since it's most likely not going to see an MU release, this is probably the only way you're going to get a Carnage that's in scale with the rest of your figures. I really looking forward to potential repaints and slight remolds as some of the other symbiote characters.